I love a challenge. The tougher the better. And being a competitive person, I HAVE to succeed and win. Last month when Peanut Butter & Co. announced their holiday Yum Squad project, I was quite intrigued. The challenge was to create a dessert incorporating peanut butter and candy canes. Whaaaatt? was my first reaction. Uh, won’t that taste gross? NOPE. Ms. Paula Abdul taught me at an early age at that Opposites Attract. During the early 90s I had a tap teacher that played Paula Abdul during warm up every single week. (Somewhere in the back of my closet at my parents’ house, I still have my Straight Up cassette tape.) So if opposites can attract, you bet I can make a delicious dessert out of these two unlikely pairs. Chocolate and peppermint is a match made in holiday heaven, so I knew I had to incorporate chocolate in this dessert. I thought about melting chocolate and whipping it into smooth peanut butter. But why add that additional step when a jar of Dark Chocolate Dreams already does it for you?! 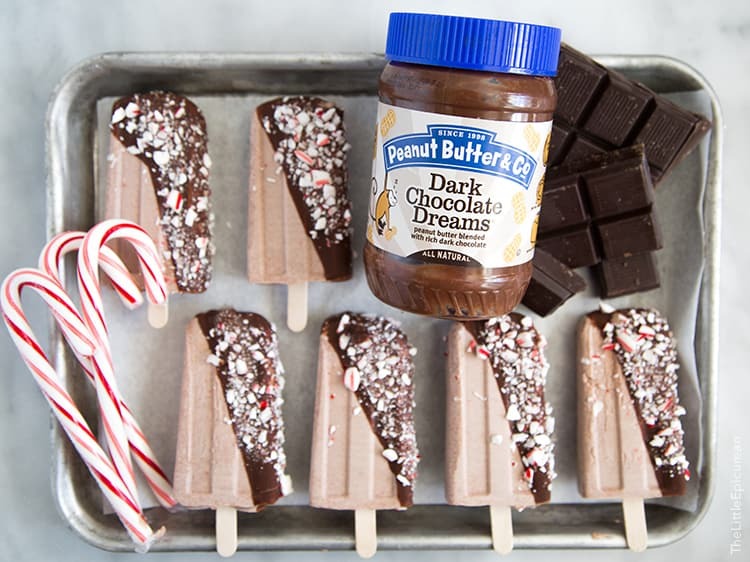 These frozen bars are made with a chocolate peanut butter semifreddo. Before I had an ice cream machine, I made lots and lots of semifreddos. Instead of using a machine to fluff up and aerate the creamy mixture, you use freshly whipped cream to amp up the volume. The whipped cream is folded with the rest of the liquid ingredients and frozen to create a soft ice cream treat. It’s the perfect mixture to freeze into bars. Now that that holiday season is in full swing, get ready for peppermint and candy cane overload!! As a special holiday treat, Peanut Butter & Co is offering readers 25% off online store purchases for the entire month of December! Use discount code: YUMSQUADLOVE to get peanut butter crazy like me and make your own #CandyCaneHacks this month. In a medium pot, combine milk and sugar. Set over medium heat and stir until sugar dissolves. Remove from heat and whisk in chocolate peanut butter. Whisk until smooth and homogenous. Transfer to an airtight container and store in the fridge until cold. Using a hand held mixer, whip chilled heavy cream to almost stiff peaks. Add 1/3 of chilled peanut butter-milk mixture. Using a large sturdy spatula fold into whipped cream. Add another 1/3, fold, followed by remaining 1/3. Fold until there are no longer any streaks of whipped cream. Immediately transfer mixture to popsicles molds, filling molds all the way. Place in freezer for 15 minutes and then remove. Insert wooden sticks into popsicle mold cavities. Return mold to freezer and freeze for at least 4 hours to fully set. To make chocolate shell: combine chopped chocolate and coconut oil in a small heat-proof bowl. Set over a pot of simmer water, creating a bain-marie (double boiler). Melt chocolate over low heat. Stir to combine. Once chocolate has melted, remove from heat. 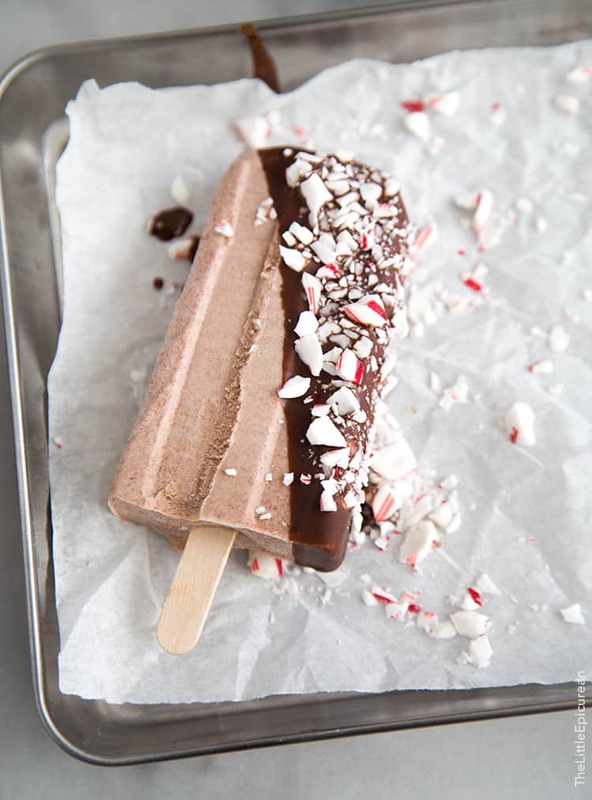 Dip frozen bars into chocolate shell mixture and immediately sprinkle with crushed candy canes. The chocolate will quickly set, so work quickly! Consume and enjoy immediately. I absolutely love this, Maryanne. I think you nailed the challenge! These bars look way too good! Pinned. The craziest PB concoction: my husband puts it on EVERYTHING. Not joking. The craziest thing we made was probably some sweet potato peanut butter wraps. yummm…I love peanut butter banana ice cream! I love peanut butter and condensed milk! 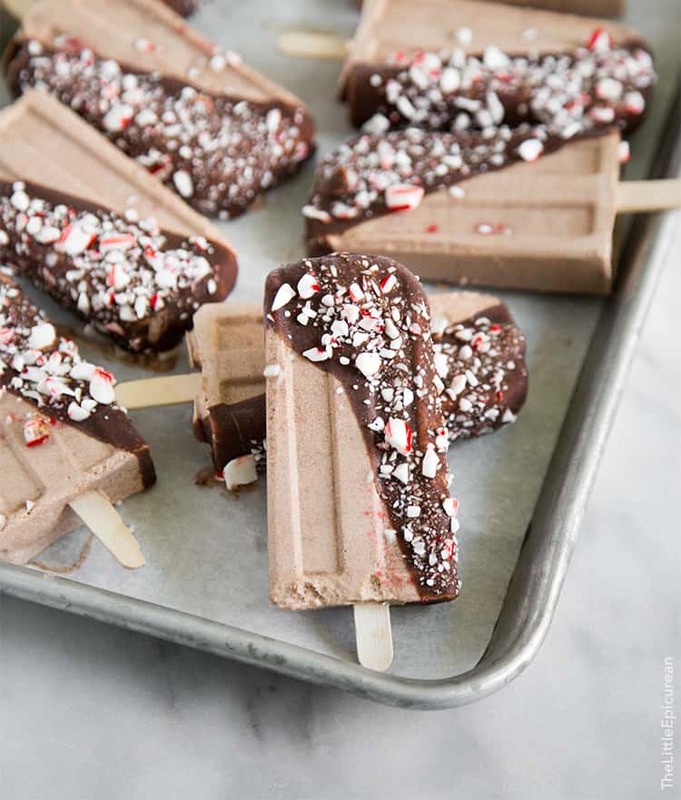 These popsicles are screaming my name – I’m a bit of a peppermint fanatic. (Funny enough, I just made some muddy buddies this week with peanut butter and peppermint!). Craziest thing I’ve done with peanut butter? Hmmm – my mom just sent me a picture of a recipe I used to make all the time as a kid that was basically peanut butter mixed into balls with coconut, raisins, and honey. I was a strange kid. Whaaa?! That’s crazy! Haha, I totally thought peanut butter and peppermint couldn’t work, but it tastes good together! I LOVE peanut butter… my favorite concoction would be melted peanut butter with ice cream, preferably chocolate ice cream! I don’t think I’ve made anything too crazy but the peanut butter shortbread was…interesting! My husband thinks I’m crazy, but I love a peanut butter and spinach sandwich. Whoa! That’s a combination I’ve never heard of! I used to eat a heaping spoonful of peanut butter, by itself, every single day, for over a year straight. I love peanut butter. 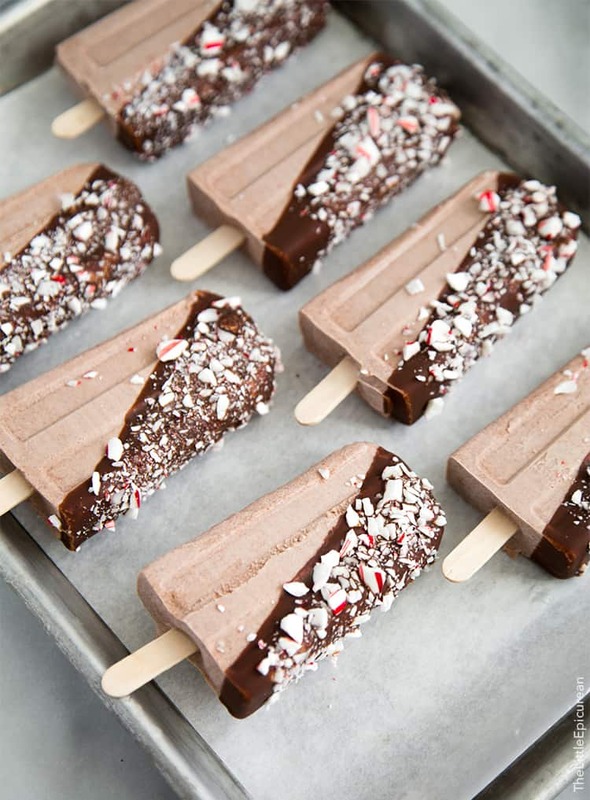 How delicious are these ice pops… perfect for Christmas especially. Pinned! These look so yummy! I don’t care if it’s arctic out, gotta have these! Pinned! First off, these look amazing and I want to eat them all! And the craziest concoction I’ve ever made with peanut butter was a reese’s inspired 3 tier cake that made with 3 layers of dark chocolate cake filled with peanut butter mousse in between each one, then frosted with peanut butter buttercream. I also poured some chocolate ganache on the top and put cut up reese’s cups on top of that as a garnish. One of the most decadent but amazingly delicious cakes I ever made. Oh man! That sounds UH-mazing! I want a slice! Nothing crazy, I just eat it all the time! nothing crazy but i love peanut butter and use it in all my baking recipes and especially love it melted over peanut butter. These look gorgeous! I love Peanut Butter Co. and the dark chocolate peanut butter is one of my favorites too! Love that you made peppermint treats, it sounds incredible! Potato chips dipped with peanut butter! I tried goldfish in peanut butter the other day, it was great! I used to eat cheese crackers filled with peanut butter! YUM! I made these crazy brownies with peanut butter rice crispy topping! I really haven’t made anything crazy with peanut butter, but my husband had a burger with peanut butter on it. He loved it! I saw that combo on a menu! Nothing too crazy. Just love peanut butter and chocolate. Whoa this sounds so intriguing. I would never think to put PB and peppermint together. But I’m totally down. Hmmm….strangest PB combination. I can’t think of one for myself, but my a friend of mine used to put PB on carrots. I thought that was pretty weird! Oh. My. GOSH. These are beautiful!!! So happy I just found your blog! I’m a fellow Yum Squad member.. I still have to post my recipe! Wow. What kind of lens/camera do you use?! I can’t get over your pictures! oops, never mind… just read your faq section. :) I might be your new stalker, just to let you know! In a good way :D love your blog! While not really crazy, the most recent combo I had was peanut butter and honey. Wow, I would NEVER think to mix peanut butter and candy cane. I am totally intrigued! These are going on my to-make list!